Not much about buying a car seat screams "easy" and with the recent and proposed changes to legislation in the U.K, it's not going to get easier any time soon. This is a guide which will help you make sure you buy the best car seat for your child. UK law (which came in effect in 2006) states that "Children must normally use a child car seat until they're 12 years old or 135cm tall, whichever comes first." Also, rear-facing car seats must be used for babies who weigh less than 9kg (nine months old, or thereabouts) - after which they may move on to a forward-facing car seat. However, child car seat law has recently been updated. 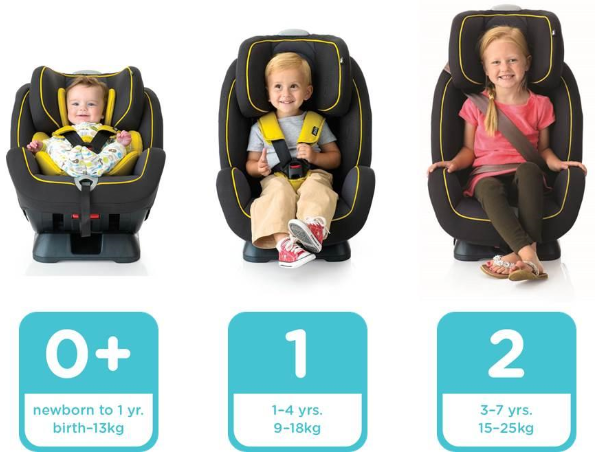 First introduced in 2013, a new European safety standard called i-Size (or ECE R129) has now become part of UK car seat legislation, so it's recommended that you keep your child in a rear-facing seat for as long as possible - at least until she is 15 months old. The new safety standard doesn't replace existing car seat law but will run alongside it until sometime after 2018 when only iSize seats will be sold. Until that happens you can choose whether to move your child from a rear-facing car seat - once she reaches 9kg - to one that faces forwards, or keep her rear-facing for longer. You can read more about i-Size here. This stands for International Standards Organisation Fix and it's the standard system for safely securing a car seat to a vehicle's mainframe. An ISOFIX car seat is one which can be secured in your car by attaching it to the vehicle's ISOFIX anchor points but you must check that the seat you want to buy is compatible with your vehicle, as some older vehicles may not have ISOFIX anchor points, and not all car seats are suitable for all makes of car. 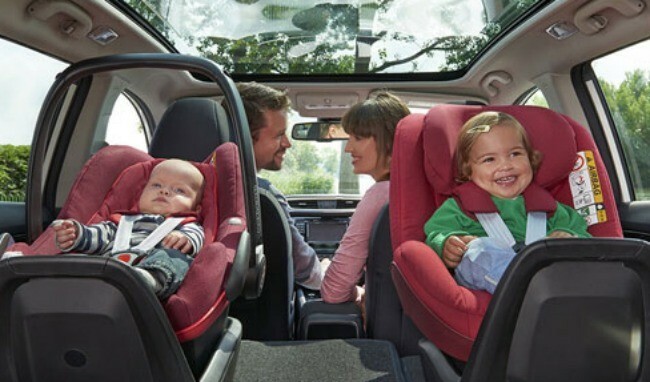 Car seats are categorised into separate 'Groups' but many seats cover more than one 'Group' (these are sometimes referred to as 'combination seats') so you might find it more helpful to think about baby car seats, toddler car seats and child car seats. Car seats vary hugely in price but you don't have to spend a fortune to keep your child safe. 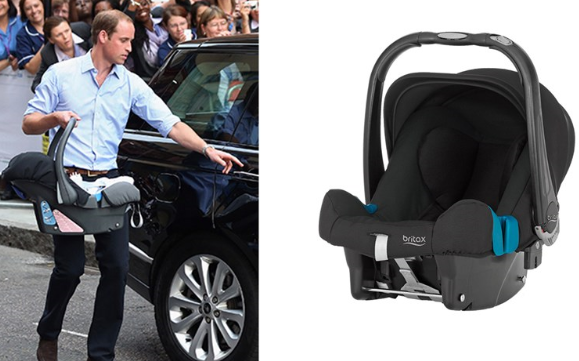 Britax is probably one of the best known, and most trusted, car seat manufacturers in the UK and indeed it's a favourite with the Royals - both Prince George and Princess Charlotte have used the Britax Baby-Safe Plus SHR II*. Costing around £130, it's suitable from birth to 13kg (around 15 months) and has been described as "robust, super safe, well-made and affordable". If your budget doesn't quite stretch to that, the Mothercare Ziba* has been described as a "versatile, lightweight car seat" that "offers the same, if not a better level of comfort as most well-known brands at a fraction of the price". It's usually £70 but is often half price at £35 from Mothercare. Lots of parents buying a car seat for this age group choose a travel system (i.e the car seat can also attach to your pushchair or pram chassis) which is a handy option if you don't want to have to wake your baby by lifting him out of the car seat to pop him in the pram. The Maxi Cosi Pebble Plus* has won just about every award going and is probably one of the most popular car seats for newborns. Suitable from birth to around 12 months, that one will set you back around £190, with the base costing around the same again. Although this may seem expensive, the safest way to install a baby car seat is with the corresponding base. The Britax Prince Group 1 car seat* (suitable from 9 months to around four years) is very lightweight, at 6kg, and easy to install, which makes it perfect for transferring from one car to another. The fact it's fitted using a 2 point seat belt perhaps makes it most suitable for older cars or larger families. Although the R.R.P. on this is £130, you can generally pick one up for around half that. It's worth noting if you have a larger family and it's not possible to fit a third car seat into the back seat of your car, a child over the age of 3 can sit in the back – in the middle, between the 2 other car seats – using an adult seat belt. This is obviously not as safe as a car seat, and is not recommended unless it's absolutely necessary. You can of course purchase car seats that combine stages. Joie is a brand that has won a load of baby awards and their "Stages" car seat system is especially popular. A Mother & Baby Bronze Award Winner, this one is suitable from birth to around 7 years. There's new legislation just been announced about Booster Seats recently and most parents seem to have welcomed the news. 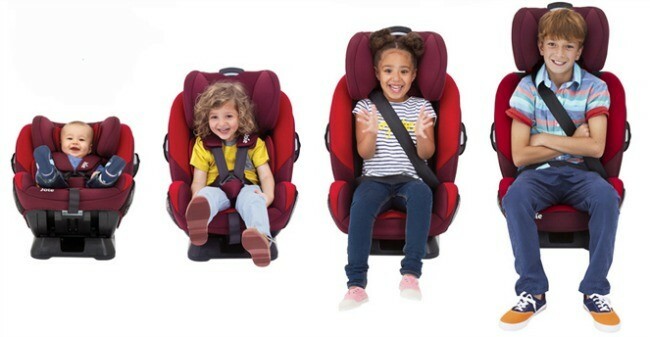 While cushions are generally cheaper, they simply don't offer the protection to children's necks and back in the event of a bump or collision but ultimately which type you choose will be down to your family needs and budget. The Bubble Bum is a portable, lightweight, inflatable car booster seat for children aged between 4-11. It's won a ton of awards and the fact it deflates and packs away makes it perfect for holidays, taxis, coach journeys, school trips or car pooling. I think the most important aspect when choosing a car seat is to take your time and do your research. Make sure that is fits all the cars it will be used in (partners', grandparents' etc) and get professional advice. Halfords, Mothercare and many other retailers can advise you comprehensively and even ensure the car seat is safely installed in your car. It's also worth remembering that buying a second hand car seat can be risky unless you know it's full history. If it's been in an accident already it may not provide adequate protection for your child - not a risk I'd be willing to take. So what about you? We'd love to hear about your experiences, good and bad - which car seats would you recommend to other parents? Yes it does apply to the sale of new seats only - but please anyone who is thinking of continuing using a backless booster on your young toddler / child - think of their safety. High back boosters are very cheap, britax do one which has been praised as being a great budget option for only £29. Some people don't have 29£ spare and I have twins so would be practically 60£ it's not s cheap option at all. Just saying. I would go hungry for a week to potentially save my toddlers life / prevent serious injuries. May just be me though . . . I would sell every possession of value possible to protect my child. Just watch the crash test dummy videos and see how dangerous booster seats are. Bloody hell, can't believe what I've just read! Lucy Marie Faircloth how do u know she had a phone contract like?! Hi samantha - I'm sure it's called adventure. Mothercare, asda etc. Sell them at half price during their baby events. Look up good egg safety either on Facebook or web and check with them, they will offer accurate advice. This legislation only applied to booster seats bought after Dec 2016, seats available now would be fine. Although the safer option is a highback booster. There is no upper weight limit for a high back booster. 36kg is just a guide. As its the adult belt restraining them and not an in built harness it is pretty safe to continue to use a HBB beyond the recommended upper weight limit. yeah I read this it's only for new purchased seats though. Coris has a back to it. Mia's doesn't do I need to buy a new one? no you don't. It's only for new ones made or purchased from the new law date. I don't see an issue they like to change rules all the time. Goodness my son is nearly 7 and nearly 135cm but I'm not ready for him to come out of his seat with side impact protection because of his age, scares me when I see younger children in booster seats but that's up to their parents I know my son will be in his seat for a while longer! You are amazing keeping her rf, up to 4 years of age is so much safer if you are unlucky enough to be involved in an accident, I used to work for mamas and papas as a car safety expert and some mums took a lot of convincing to keep their child rf! They first thought about the need to see their child or their child doesn't like not being able to see where they are going? Among other ridiculous statements they hardy ever considered what was the safest option!! Hell, I would ride in a high back booster seat if it was legal - I'm short, high back boosters are comfy (son has cybex and it's sooooo squishy) and it's an irrational fear of mine that I might become paralysed. Even when driving - wouldn't that be classed as restricting movement?! Haha! I'm not 100% sure on that. I can sit in my lg's seat. I haven't checked if I fit with the headrest fully extended, but width I fit.